Do you have tires cluttering up your personal space at your home or office? If so, be sure to check out the tire disposal service that we offer here at South Bend Junk Removal. We offer tire recycling in South Bend IN and also offer used tire disposal in Elkhart Indiana as well. Our service area is large and as a result, we can help a wide varietyof future customers when it comes to scrap tire disposal. Our services are far cheaper than those of other tire recycling companies in our service area. We believe that our customers should get the best value and as a result have very low pricing as well as an inexpensive tire disposal fee. When combined the cost of the service as well as the fee is still several dollars cheaper than the pricing offered by national tire recycling chains and that is a fact that we as a whole company are proud of. If you are considering recycling tires for cash there are a few things that you should consider before doing so. 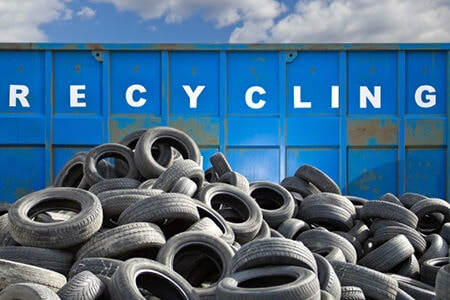 The biggest benefit that comes from recycling tires is that it saves landfill space. This is a greatperk as tires typically take up a great amount of space within landfills. Landfills are a finite resource and it is important that we keep those resources for items that actually need to be placed there rather than being recycled. This will make the earth a better place overall and you are sure to feel great knowing that you did your part to make an impact on your local community due to the fact that you are not taking up space that could easily be used for other items. You should also be aware of the fact that recycling tires can lead to other new products to be created that may not have been possible otherwise. An example of one of these products is a fuel source known as a tire-derived fuel. Tire-derivedfuel is typically cleaner than other fuels and is more energy efficientoverall when compared to coal and oils. Railroad ties and playground turf can also be made from recycled tires as well. You could make a child'sday safer by simply donating old tires that you do not have a use for any longer. We feel that these are all great things that can happen by simply recycling and we love making a positive impact on the earth. Please, feel free to reach out to our company, South Bend Junk Removal, at any time during ou business hours to ask us any questions that you may have regarding the services that we offer. We love talkign to ou customers and can't wait to talk to you. We enjoy talking about the services that we offer and the positive impact that they can have not only on our lives but our whole community as well. Give us a call today to set up a consultation meeting and to set up an appointment to have your tires recycled.